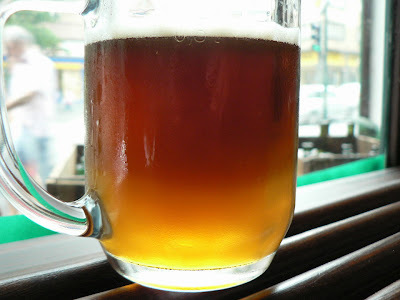 The other day reading a post in Buena Cerveza (Sp) about the world famous Newcastle Brown Ale, I noticed one of the comments mentioning how this beer is made, basically mixing a brown ale that isn't sold and amber ale that is marketed separately. Czechs have a name for this: řezané pivo, or cut beer. It isn't a beer style, but some sort of beer cocktail that is drunk quite often at hospody all over the country. Many are the Czech dark beers that have more or less intense caramel or toffee flavours and, in some cases, roasted coffee or cocoa. Mixing them with a typical Czech Golden Lager, those with a lot of Saaz, full of fruity, citrusy and herbal flavours, you can get a drink with more than interesting, and sometimes pretty complex notes. If both beers used are of good quality, they will contrast and empower each other, it will also be possible to feel the characteristics of each while some new flavour entity forms in our mouths. In the hands of a good výčep (the person tapping the beers) the diffence in density of each beer can be easily seen, with the dark beer remaining on the top. Then they will slowly mix as they are drunk. It's half gone, but you can get the idea. There are some breweries that bottle řezané pivo, calling it řežák. One of them, Řezák 11° from Pivovar Malý Rohozec, actually was chosen Poltomavé 2007 by SPP. Personally, I prefer them to be mixed at the pub, or making it myself at home, rather than having it already prepacked.